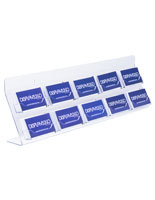 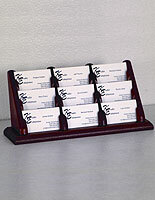 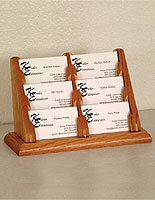 This desktop business card display that is a countertop holder makes contact information accessible to prospective clients and visitors in professional waiting rooms, reception areas, and retail showrooms. 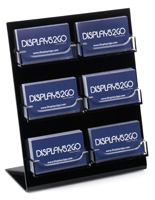 Unlike some organizers, this table mount storage unit takes up little space due to a 3-tiered design that presents contents in full view. 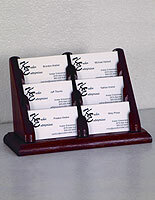 Browsing through a collection of contacts is easy with this business card display that stores 30 cards in each of 9 pockets. 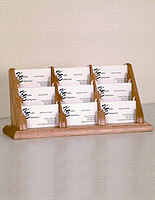 This quality wooden unit has a beautiful oak finish that enhances casual or upscale environments. 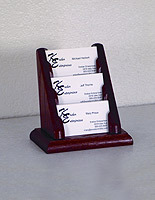 13.3" x 5.8" x 4.4"
3.5" x 2.0" x 0.5"